Day 40: Makin' It Happen! The original plan was to get to Kennedy Meadows in two days. Then take a couple days to get to Lone Pine and then about four days to get to Independence. Late last night, it came to our attention that the road to the town of Lone Pine was still closed due to snow and would most likely still be closed in about 10 days when we need to get off the trail to resupply in the Sierras. This is a major wrench in many hikers’ plans. We came up with a few options and decided to sleep on it. In the morning today, the three of us agreed that just sitting here waiting over a week would not be acceptable for us. We decided that we would just skip that town and try to just carry all our food for the estimated 7.5 days it would take to get from Kennedy Meadows to the now Independence. Of course, being the manly men they are, Top Shelf and Blister are excited to carry all this weight with the additional weight of a bear canister, ice axe, and microspikes. My little self is not excited at all about this and I’m willing to give it a try cause I like a good challenge and like to believe I can do what the guys can do. The most worrisome is that none of us have any idea what we are headed into and the Sierras are no joke. It is in the teens at night and snow is everywhere. I will need all the balance I can get and a pack well over 30lbs is not going ti help. There will always be the option to turn around if the weight is too much, but it will get lighter each day. I really hope it isn’t too heavy and I won’t know until I get to Kennedy Meadows in a couple days. It’s definitely better than sitting around while streams get higher and more dangerous to ford. Right now there are still snow bridges on many and that would be great. We have agreed to just take it one step at a time and it will be a great challenge. We decided to do what we could to make it happen today. 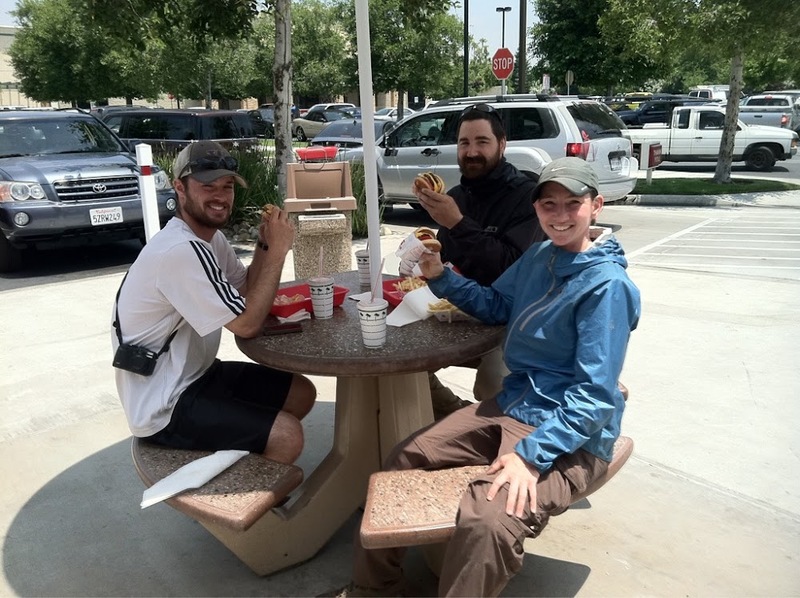 We took a bus to the closest city of Bakersfield and rented a car to go to an outfitter for Sierra gear. I got my third Platypus bladder of this trip and it better not bust! Blister and Top Shelf are carrying a ton of weight and already have about 7 days in food in their packs. Then they will get more at Kennedy Meadows. I had to get my packages in Lone Pine bounced further up the trail and they were able to send my bear canister to KM. My new SPOT is also there and it should be up and running in a couple days. I will resupply in KM from what they have and Blister has way too much and will probably be able to fill in the holes. To complicate things further, there is no phone reception at KM, so there is no way to contact hikers ahead of us who we had hoped to meet in Lone Pine. We are so glad we stopped at Lake Isabella because many hikers didn’t find out til they got to KM and are spending days there figuring everything out with only Internet and no phone. Now our packages can get to where we need them while we hike. Some hikers are shuttling up north to do some miles in N California and then coming back in a week or two. That would really make us feel like our hike would always have an asterisks next to it and we have to at least try this way. It wasn’t all work today. The guys are at the movie The Hangover 2, and I am hanging in the hotel with my Hulu shows:) They are also excited about the hot tub at the hotel. Blister and I even got our first experience at an In-N-Out Burger! We will get back on trail tomorrow and take it one step at a time. This is a defining moment for this trip and we’ll see if we make it! I’ll post when I get signals, but I know it will be spotty.